Eat your colors!! No...really! It's not only as bright as a summer day...it's also incredibly healthy to eat a variety of colors when it comes to veggies. Each color group packs its own individual punch when it comes to vitamins and minerals that it provides. I mean yeah, it's good to at least be eating your veggies, but why not experiment with new ones...I'm talking to you out there...you, who always stick with your trusty carrot sticks and broccoli buds. Next time you're packing your carrot sticks for snacking, why not throw in some slightly blanched & cooled fresh green beans and jicama sticks...go ahead, mix it up! Next time you're preparing your broccoli to throw into your meal for the day...prepare some purple cauliflower and cubed squash to throw in with it? Sure, you may not like everything...but how will you know unless you try? Plus, the benefit of various textures and flavors in a dish are just as great as the expanded nutrients you'll be ingesting! You'll take longer to chew your food and savor those new elements on your tongue...therefore taking your time---slowing down. You'll be...hmmm, what's the word?...oh yes- SATISFIED! GREEN: vitamin K, folic acid, potassium, carotenoids, omega-3 fatty acids, sulforaphane, indoles and isothiocyanates (phytochemicals), calcium, chlorophyll. "These nutrients help reduce cancer risks, lower blood pressure and LDL cholesterol levels, normalize digestion time, support retinal health and vision, fight harmful free-radicals, and boost immune system activity." PURPLE/BLUE: considered to have the highest antioxidant level of all foods, anthocyanin (phytochemical), fiber, ellagic acid, quercetin, vitamin C, flavonoids, resveratrol, lutein, zeaxanthin. "These nutrients help support retinal health, lower LDL cholesterol, boost immune system activity, support healthy digestion, improve calcium and other mineral absorption, fight inflammation, reduce tumor growth, act as an anticarcinogens in the digestive tract, and limit the activity of cancer cells." ORANGE/YELLOW: omega-3 fatty acids (some), zeaxanthin, lutein, beta-carotene, beta-cryptoxanthin, vitamin C (last 3 convert to vitamin A in the body). "These nutrients reduce age-related macula degeneration and the risk of prostate cancer, lower LDL cholesterol and blood pressure, promote collagen formation and healthy joints, fight harmful free radicals, encourage alkaline balance, and work with magnesium and calcium to build healthy bones." WHITE: beta-glucans, EGCG, SDG, lignans (provide powerful immune-boosting activity). "These nutrients also activate natural killer B and T cells, reduce the risk of colon, breast, and prostate cancers, and balance hormone levels, reducing the risk of hormone-related cancers." So, I went out to the gardens...the one in our yard and our community garden and came back with all of the veggies and herbs that I packed into this powerful meal (except the onions and garlic)...and added some Whole Grain Pasta...which added some beneficial healthy fiber to the mix! So, maybe it was all in my head...because I totally felt healthier just eating this. Who am I kidding? It wasn't all in my head...it was real. Oh yeah, it was REAL!! REAL food, REAL nutrients, REAL tasty. Begin by cooking the pasta to al dente and draining, reserving ~1 c. of cooking liquid. In the meantime, heat a few glugs of olive oil in a large, non-stick pan over medium heat. Throw in the onions, garlic, kale and carrots. Sauté until carrots just begin to soften. Throw in the 2 types of cauliflower, zucchini and peas; continue to sauté, stirring until all veggies are hot and cooked al dente...and just have a bit of color on some edges. Toss in the cooked pasta, tomatoes, crushed red pepper and chopped herbs...adding as much of the reserved liquid as needed to keep mixture just moist enough to slide around nicely in pan. Throw in a little white wine at this point, if you want as well. Cook another minute or so, then add salt and pepper to taste. When ready to serve, drizzle with a little more olive oil and add a handful or so of freshly grated Parm. I am sending this over to Pam at Sidewalk Shoes who is hosting Presto Pasta Nights this week and to Kitchen Gadget Girl who is hosting Grow Your Own this month. I'm also linking up to all of the events listed below...just click on their badges to find out more info! This is also one of my entries into this weeks Two for Tuesdays...eat REAL food! Whoa, that's a serious veggie pasta dish! Love all the bright colors. I never knew there was purple cauliflower! Thanks for all the interesting info! This looks amazing! So many colors and wonderful ingredients! YUM! This is so awesome heather! you know how much of a fan I am of eating your colors! Always a priority! UM and MOS...I actually prefer it in hot, meal mode...but it was decent in "salad" form, as well. Yes Joanne...I think you were a subconcious inspiration for this! Christo...that sounds totally trippy...eating a rainbow...I can dig it. Wow! That is packed with color! It would look great in one of my bento lunches! I wish I could find purple cauliflower! Very informative post. I of course, am more fickle and will just enjoy it for how pretty it looks and how delicious it tastes. Oh...you mean it's good for me too?! Oh wow, Heather! LOVE the colors in this dish! It makes eating veggies very interesting indeed! 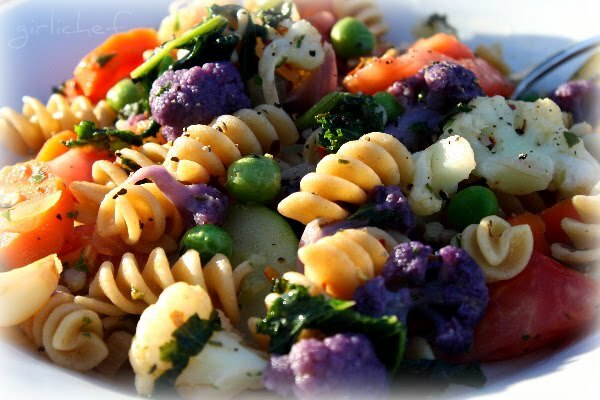 Colorful and powerful pasta dish. Perfect for summer, fresh and light. congrats! This is one gorgeously colorful pasta dish. What a healthy and delicious treat! Now THIS is a pasta salad!! Dang it looks so unbelievably yummy. I adore all the different colors and veggies you have in this, and the wine - oh how I love a little wine in my food! Absolutely gorgeous Heather!!! I love how you packed all that nutrition and beauty into one dish. p.s. I heard eating two bowls is even more healthy than eating one - LOL! I love colourful food, so much more appetising! What a beautiful dish! Lovin' the pics AND all of the nutrition info and tips. I've found that my kids won't always eat veggies at dinner, but if I thinly slice cucumber, carrot, zucchini, celery, or whatever else I've got around and take it along with us to the park or serve it on the deck, they're all over it! Southern Living did a thing about colors and health a while back but I don't think their dishes could match the color and power that you packed into yours! Nice job. 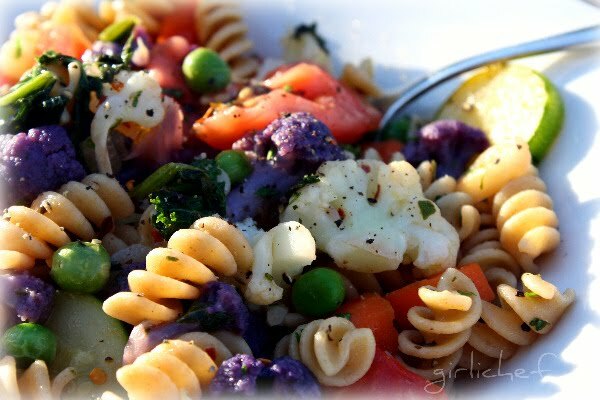 That is one gorgeous pasta salad! It's so perfect to bring to a potluck! Now this is a salad I can get into!!! Yum!!! This also screams summer to me. How fun! I do something like this quite often in the summertime but it is never THIS gorgeous! Very very nice! I'm glad that you spelled out the benefits of each of the colors. It's great to be reminded of these colors and that we should eat a variety. I am loving the power house pasta! Such great colors and so important too. I'm curious about the purple cauliflower. Does it taste the same as regular cauliflower? This is almost too pretty to eat. I'd just have to sit and admire it for awhile. So the purple cauliflower stays purple when it's cooked? I was so disappointed the first time I cooked my purple green beans and they turned green! I feel so educated after reading your post. I am missing purples (except for red onions) in my diet. They make a dish look pretty too. We have been living basically on fruits and veggies, not for health reasons but because that is what we want to eat. It amazes me. Love all of the beautiful colors and fresh herbs and veggies! What an amazing dish!!! So much color must be simulation to the eyes as well as the pallet. This looks like it would be a great way to get the kids to eat veggies.